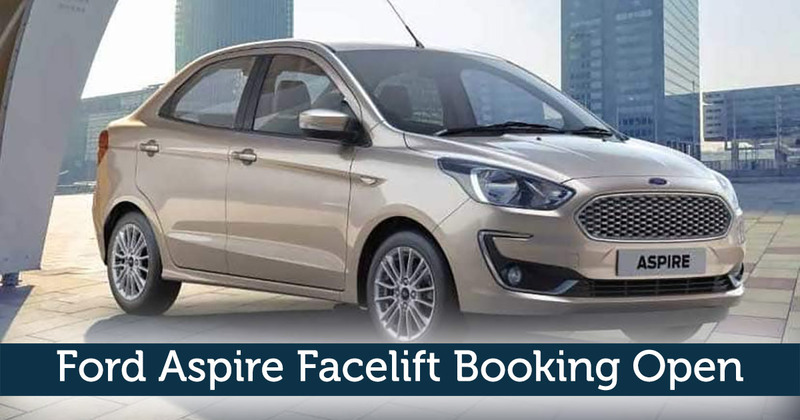 Ahead of its October 4th release, the bookings for the new Ford Aspire Facelift have officially kicked off. Potential Buyers can book the all new Aspire facelift with a token amount of Rs 11,000. The mid-life fascia update reveals that the slatted grille has been revised with a freestyle headlamp and a honeycomb mesh grille. The bumper of the round fog-lamps is almost the same as the predecessor. The tail section is not changed and it maintains the same look, although tail lamps have been revised. A welcome new editions are the 15-inch multi-spoke alloys wheels. Apple CarPlay and Android Auto Support. The new Ford aspire gets a 1.2-litre, three-cylinder petrol engine from the Freestyle and that will create a new hot hatch of Ford Aspire, excluding that little boot. Transmission duties will be aided by a 5-speed manual gearbox. The 1.5-litre diesel manual engine will surely continue on the list. When it hits the Indian roads, the Ford Aspire Facelift is expected to carry a price tag of Rs 5.82-8.79 lakh for the petrol trims and Rs 6.93-8.56 lakh for the diesel trims.